You've done great on that overall look. I really love all the framing over the entrance and the bay windows and tower sections! Benches, flowers, and a walkway will complete the look for the outside with maybe a fountain or sculpture. Inside you could have maybe a ladies floor and a men's floor like some department stores have, or a tatoo parlor (and stylist sections) upstairs with clothes racks on the ground floor. The top floor could be where the stylist works on research ideas at the drafting table with a couple of the dress models. Each floor could have a bathroom or two. I like to use the all-in-ones for toilet stalls and add sinks and mirrors for appearances. (This cuts down on stinky sims as they get a shower when they use the toilet.) I also like to add potty chairs and trash cans just in case I have toddlers visiting. If you have a lot of room, you might make a children's play area to entertain small ones while mom shops. And, you could add places to sit for the long-suffering husband or worn-out mom as you know how some spend so much longer looking and trying on everything than others. Add a book rack and/or television to give them something to keep them occupied. Do any of those ideas help? @Ciane, those ideas are great! I appreciate that so much because I've really been at a loss about what to do. I like the idea of having a mens department and a womens department, but I think it would be difficult to differentiate the two, unfortunately, especially because the steampunk look is sort of masculine looking as it is. I love all of your other ideas and see what I can come up with. I'm slowly making progress on my steampunk salon. I've redone the outside from the front of the building to give it some of those steampunk colors that I desperately needed and have added a non accessible balcony on the second floor, flanked by two gargoyles. I've also placed some showtime prop windows directly behind the greenhouse windows. They're really showing up in MH, so I'm going to recolor it. I've also finished both of the window displays. This is my work in Moonlight Falls lighting. When I place it in Midnight Hollow, where I expect it to go when I'm finished, the siding medals really POP! The exterior of the Salon is looking great! 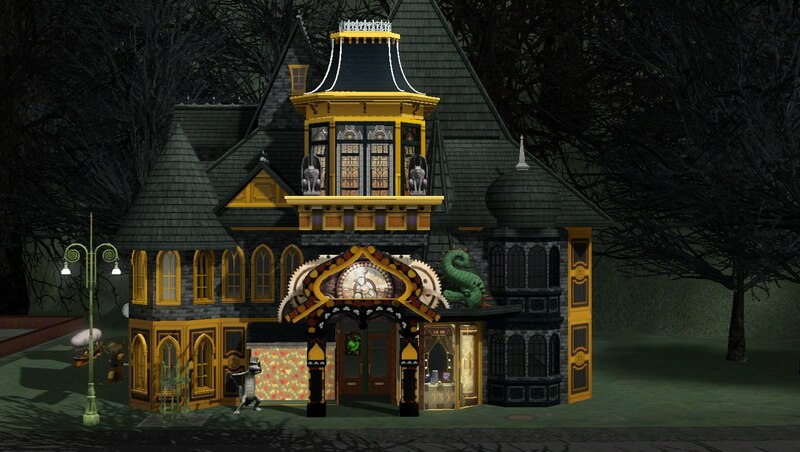 The steampunk colours used for the exterior look great and reflect the theme well. The addition of the balcony and the gargoyles adds a great look to the build. 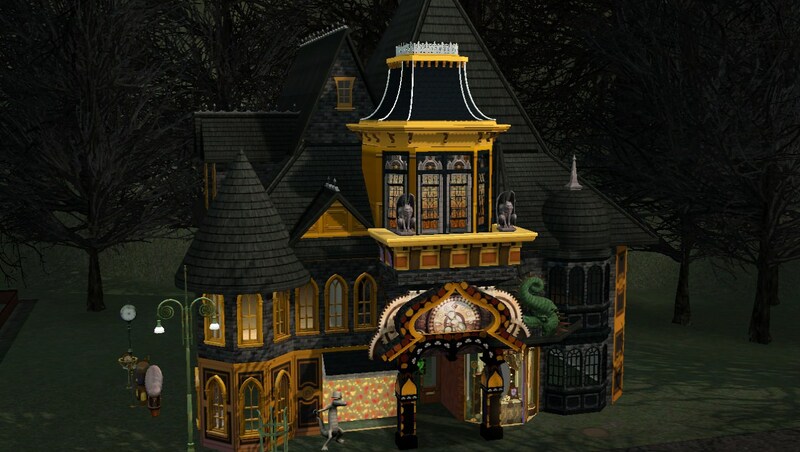 The golden metal looks especially great in Midnight Hollow! I'm still working on this build. Don't worry! I'm just going super sloooooow. Would really like floating countertops. Unfortunately, I think I'm out of luck. I'm making significant progress on my salon, today. Can't wait for it to be done, so I can show you guys. It's lookin' good! I will look forward to seeing your salon! I am glad that it is progressing well. My salon is coming together really well. The 20X20 lot is proving to be a little bigger than I anticipated. I have already put everything salon and spa related I can think of and even allowed some extras that are a little fun, but I STILL have lots of room left over. I may go ahead with a little kiddie area and extra seating, so I can fill those spots in, too. Another bit of a roadblock had occurred a few days ago, when I had a sim make a bunch of fashion sketches as well as masterpiece artwork to place in some of the areas throughout. I thought this would be especially fitting because there are a couple sketches with steampunk goggles. I knew that framing the artwork would cause it to disappear, but I hadn't thought that saving the lot to bin would place all of the artwork back into the inventory of my sim, which means that I cannot share the lot along with the artwork. I do, however, have a new steampunk girl that I plan on sharing that would go into the stylist profession . . . I might place the art pieces in her inventory. I'm also thinking about making two versions to put on the exchange. I chose the 20X20 lot because, sometimes, depending on which world you're in, it can be a struggle finding big enough lots without sacrificing another favorite lot. So, I would share this small version, which only allows me to do very minimal work on the outside and perhaps a slightly bigger version with landscaping out front. I should have the lot finished within the next couple days. I only have a few more spaces to go and then I'll work on the outside and see if I want to make two versions or not. My steampunk salon and spa, 'Shut Up and Style Me!' is FINALLY here. Let's take a tour, shall we? I didn't want to do too much outfront. I think having it on this smaller lot and using floor tiles rather than terrain paint and plants makes it easier to customize to your world. Because the siding is covered in so much metal, the lot as is is best placed in Midnight Hollow, but a little recoloring can fix that easy! An even closer close up, so you can see what's inside this display window. When I first made the lot, I only did the front portion as I showed you in my WIP pictures. I was working on the inside and then realized that all the windows looked odd, but I couldn't just rearrange all the work I did. Honestly, coming up with this design and layout was incredibly difficult this time around. No way I would do it again, so I decided to extend the roof out further so I have a symmetrical look on this side. It was a little harder because I used the constrainfloorelevation cheat in order to make some pieces of the roof look good, but once I went back, I was able to figure out how to make the levels even again. This is the entrance and the first room I worked on. It has clothing and styling displays, a beautiful custom vanity I put together, a nice seating area where sims can read magazines and books. In the center, I placed a chair and table, so sims can get manicures and pedicures , and in the back there is a massage table with fake seating. Some of the rooms are opened up with these gorgeous windows from ITF. I tried to take some pictures with my sims in action, but the game gets annoyed if you click on the TAB key too often, so I was only left with a couple. And now we're getting into the hair salon. I tried to make it as real as possible, so you've got the place where sims can fix hair, wash hair and wait for dyed hair to set. The seat I used for that is the foot massage one from the sims 3 store. Of course, you've also got the styling station for your makeovers. The next space is my clothing shop. I used the consignment register in this space, so there's even more things for your sims to interact with. There are a total of three ITF pedestals. They're all set for each age group and gender. This was easily the most annoying part of this project, but I was absolutely determined to get it done, so I could go on with designing the building. Note that some of the styles are better than others and if you don't want something or perhaps want to even add on to the pedestals, you can do that without worrying about them resetting. Without mods, however, you have to own the shop in order to change the pedestals. Sims are not allowed to purchase salons, so you'll have to set the lot to something else in order for them to buy it. Again, the pedestals will not reset during this process. Trust me. I tried it. I also used a lot of store content for the clothing. Along this wall, I wanted to put the art sketches my sim had made. You might find that a good place to keep yours. This is the design for the bathrooms. The left one is male and the right is female. Each has very little differences. The mens room has a urinal in one of the corners and the ladies room has a sculpture in that same spot. The artwork on the wall is different, too, but other than that, they are the same. Upstairs, I have an art easel for sims to research fashion concepts or practice painting. I couldn't do this lot without Artisan's Glassblowing and Jewelry Making Station. Long before I got the outer look of the building done, I was also looking forward to place these perfume bottles everywhere, but it doesn't work like that. This is sort of an extension of the sauna to its left. On the opposite side we have the tattoo parlor. This is a mini lunch room for the stylists with a fridge, coffee maker and seating. And then we have the sauna. Shut up and Style Me is such a very creatively designed and very detailed Steampunk themed salon and spa! You have put so much time and work into such a very nice detailed venue! It looks very Steampunk ornate! The exterior design, the roofing, the display windows, the entrance area and each area of the interior looks so very nice! The furnishing of each area is done so very well! It looks very realistic. The wall and floor patterning looks so very special! It was very nice going on a tour of it with you through pictures and words. It is a very nice venue for Sims to enjoy visiting! @rosemow, thank you so very much! This build was very time consuming, but I love the finished product and it will be a great place for my sims to hang for sure. Your new Salon looks Fabulous! I don't know how you get things so bright in that dark world! LOL Still haven't figured out what you moo'd with the clock panel over the door. I keep thinking I've seen that shape but can't place it. But Love how you made it look like real hats on the SN statues! I've never thought of doing that and I don't think I realized just how many gear items there are in game. Off to rec it! I have so many comments about colors and lighting. Apologies for my little rant in advance . . . I'm actually using a terrain paint and plant recolor mod, now, and I just love it. All of the terrain has been replaced with Moonlight Falls grass and the plant recolors turn a lot of the trees a muted green and makes other plants more bright. It's not really necessary, after that, to use any kind of lighting mod. Alone, it really just shows how gorgeous the world is. I've recently downloaded some beautiful lots that go so well with the world, so I can't wait to really dig in for the first time and SEE. For the final outdoor shots in my completed build post, I took out both mods, temporarily, in order to show how it would look like in MH, regularly. The siding is mostly covered in medals, so darker lighting in game really makes it come out brighter and viewing it in certain angles might make the siding appear a different color, as you can see in my WIP pictures. Besides that, I personally, would like to see brighter colors in this very dark world. You really cannot go wrong. Everything goes with grey! I moo'd a piece from the Mother Russia set over it. And above that, where you see my nonaccessible balcony (you see how thick the space between is? ), I moo'd some kind of black column with an arch that's actually intrigued me for a long while. So, it really is nonassessible, even if you tried. That is not flooring! The column fit so well there and the great thing is that you don't even know it's there. Yes! I would have absolutely loved if the statues allowed more recolor options by allowing us to do their hair and skin different colors, but I make due with what I can. I think I've done this hat and tie thing with another statue in my mindcentury modern build (i think that statue came from University) and my steampunk roller coaster lot I used these ones, again. I like to use them like a display pedestals for hats and ties. That's where I find them most useful and probably why I haven't found any use for the supernatural brain statue yet even though I pull it out for possible use EVERY. SINGLE. TIME. But nooope! One of the hardest things is trying to steampunkify a lot. The most helpful items I find come from showtime props. There's quite a few in there that can be recolored accordingly. A lot of other useful items for steampunk builds is 'buydebug' for ambitions. Outside of that, I cannot resist the store, so anything that looks even a little bit industrial is fair game. I made a new steampunk girl to go along with the salon I made. Willow Huntley and the household version, which includes the artwork and sketches I wanted to share in my salon. BIO: Willow Huntley considers herself "fashion forward", in such a dreary town as Midnight Hollow, where her style hasn't piqued much interest by the townies. That, however, hasn't stopped her from dreaming big dreams. She wants to become the best and most sought after clothing designer, ever. Will she achieve her dreams or will she continue to stick out like a sore thumb for as long as she lives? 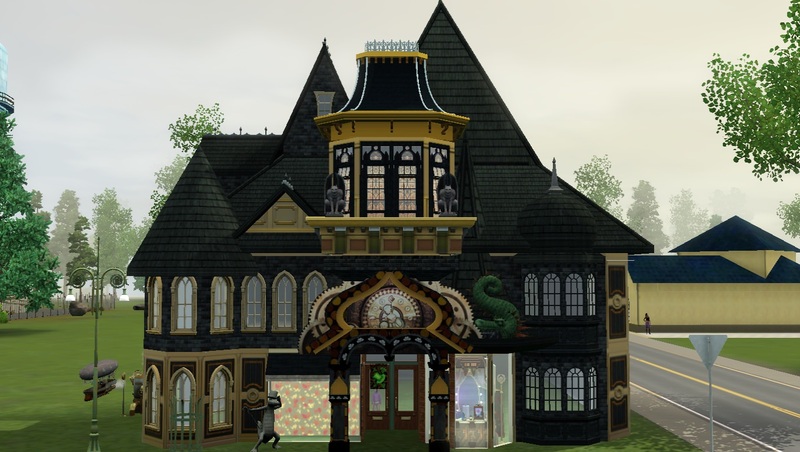 Willow is a very nice steampunk themed sim ! The colour and the patterning of her outfits looks very nice. Her headwear , hat and gloves are a nice part of her outfits. Her Autumn themed outerwear is a nice touch. Thanks, @rosemow! I tried to match her outfits a bit with the style of the salon, so they really do belong together. Already got a new build in store. I don't think I'll be sharing WIP pictures this time around, as I rather it be a surprise, but can tell you it's very exciting (to me!). I hope that your new build goes very well I will look forward to seeing it! Thank you! The spa took me a long time to build and Willow is probably one of my new favorite sims. I've never played the stylist profession, so it might be fun to try it out with her. In the meantime, I'm working on a new build. Thanks, @soocoolsim! I got some great ideas from other simmers about how to make a salon look real with the hair washing areas and using the foot massage chair. That's the first time I've ever used that thing! I definitely would not have thought of any of it if I hadn't come across their awesome creations . . . I still browse through the exchange for really old lots, so I get quite a few ideas and, of course, snag my favorites. My super secret, brand new project is here, just in time to celebrate the holiday! Sooo, mees been wantin' to do townhouses for a long, long time. I just never thought that it would first be Midnight Hollow, if ever in Midnight Hollow. Dark lighting, dark houses. You know, can't see and all that. But since I opened up to a few mods (not pictured), as I have mentioned previously, I can finally Midnight Hollow. So, I started my work on 69 Breach Bend, a 20X30 lot. Yikes. That seems small for townhouses. Apparently not! The homes fit the size of the lot perfectly and are about 8 X 13 each with little changes to the entrances. The two on the left only go up two stories because the third floors have been lowered in order to create my roofs. The home on the right has the potential for a third floor within the Mansion pieces, if you need the room. Each home has it's own character and design, so you can find some variety in these linked townhouses. The one on the left is our home, decked out in a gothic type theme. I mostly used blacks and whites throughout. The other two homes are unfurnished and completely customizable to your liking! I only used the 'hidden room' marker for the screenshots, so no worries! Forgive me! There's a lot going on in this room! I finally made use of this awesome bust! One of my favorite parts of designing was making this piano. Not only does the spellbook look great moo'd with the piano, but it also goes along great with the gothic look! Yippee! I was going to put a chess table here, but the fireplace is on the opposite side of the wall, so sims could not sit. Unfortunately, it couldn't be placed anywhere. On the bright side, I think this decoration looks nice, right? Like almost always, the first room I designed was the kitchen. I wanted this one to be really BIG! I used these cabinets because I thought they would go beautifully with the gothic theme. These ones, I've never used before, but I love the yellow against the black. I really like having a table runner. Upstairs, we have a hallway, which leads to the two bedrooms and bath. I'm so glad I decided to make the bathroom larger. It might be my favorite room of the whole house! Finally, I just have to comment on this little bugger right here. I really like that thing, but it's just too tall! It was never meant to stick out as much as it does in the download. I worked on a solution, but it will not transfer over correctly and will, instead, reset itself back into normal position each time you place the lot. So, I will share what I did.